A great clip about one woman's idea on how to help the poor of Indonesia support themselves while alleviating the trash problem as well. Check them out at XS Projects. We'll finally get to see the new Nissan August 2nd (that's Tokyo time, it'll still be the 1st here). I assume they'll have the name finalized by then, too. I'm kind of excited to see this car, having tested the drivetrain in the Nissan Cube. The drivability was similar to my RAV, but quicker. Since the Cube is 200 lbs heavier than the final body of the EV, it should be a bit quicker still. The best thing about the Nissan is the expected price range of $25K-$34K. This is before the $7,500 federal tax credit. 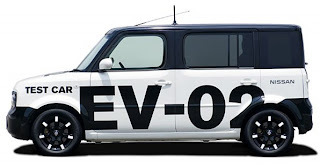 Some think Nissan is taking a gamble by rapidly moving into mass marketing of EVs. They compare Toyota and Honda's approach of "wait and see how the market materializes for EVs, then jump in". I think it's Toyota and Honda that are gambling. They own the hybrid market and are doing quite well, thank you, so why adopt a whole new technology that's untried on a large scale? The gamble is that Nissan grabs the EV market and dominates it till BYD (China) enters the U.S. in 2012. Those who make the decisions to forgo battery EVs in favor of plug-in hybrids only, ignore a sizable market. I can only assume they have not spent any appreciable time in a well made EV. The benefits overwhelm the perceived problem of range. Once several thousand people get the opportunity to buy a well made EV the likes of Nissan's, the demand from the early adopter's friends and family will expand exponentially. Of this I am certain. Of course, we need millions of plug-in hybrids, too, so more power to everyone contributing to that market. It's interesting to speculate as to the relative market share the EV will have to the PHEV. I'm guessing close to 50/50. It'll be mostly driven by the cost of gas, that's a given. All I can think is that Carlos Ghosn (Nissan CEO) has driven an EV, maybe the RAV itself, and this is why he's positioning his company to be the leader in EVs. He knows how good it feels to drive a quiet, powerful car that doesn't pollute. One that only uses domestic energy. He knows that if given the choice, millions of people would choose that over a car that poisons the air and uses mostly foreign energy. YOKOHAMA, Japan -- Nissan Motor Co. CEO Carlos Ghosn is spending big money to make electric vehicles in high volumes -- and soon. On Aug. 2, Ghosn will unveil the first of three electric models in three vehicle segments that he plans to sell by 2013. The vehicles will be made in the United States, Japan and Europe. The first Japan-built car goes on sale in the United States and Japan next year to fleet customers such as corporations and local governments. It will be a four-door hatchback seating five people -- about the size of the Nissan Cube or Versa -- with a range of 100 miles per charge. Pricing isn't set. Batteries are expensive. But Ghosn thinks rising oil prices will tilt the economics in favor of electrons. If crude oil rises above $80 a barrel, Nissan's electric vehicles will be cheaper to own and operate than gasoline-powered cars, he says. The machinery needed to make 50,000 batteries a year costs more than $300 million, he said. Add in other costs, and the price tag just for battery plants in the United States, Japan and Europe -- which together will make more than 300,000 battery packs a year -- could total about $1.5 billion.